It's important for beaded jewellery to start with the right foundation. 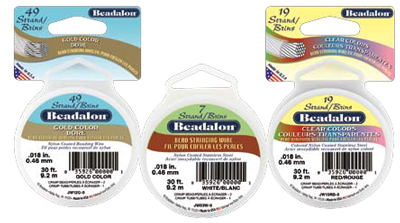 In this blog we'll be explaining how to choose beading wire - what construction, what diameter. It's all about flexibility, hole size and break strength. 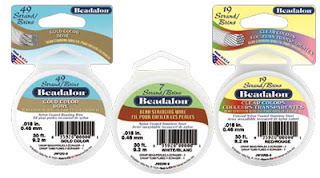 Flexible beading wire is made of several strands of very fine nylon coated stainless steel. It combines the softness of thread with the strength of stainless steel. It's the most abrasion resistant stringing material that you can use. Use it to create durable, flexible designs. The main thing to know about jewellery beading wire is that the higher the number of strands, the more flexible the wire. There are a number of factors to consider when choosing the right beading wire for your design. The first thing to think about is how much flexibility your design will need. A bracelet, for example, needs more flexibility: it needs to wrap around the wrist in a small circle; it's likely to get caught on clothing or a corner. Bracelets have to be able to withstand a lot of wear and tear. A simple beaded necklace may not need to be as flexible. Choose 49 Strand beading wire for designs that require extreme flexibility, 19 Strand for designs that require good flexibility and 7 Strand for designs that require some flexibility. Consider the weight of the finished piece. The wire's packaging will list the break strength of the wire. That's how much weight it will take for the wire to break. Choose wire with heavy break strength when using large or heavy beads. It's also wise to choose a heavy break strength for pieces like bracelets that may snag. How costly are the beads to be used in the design? How much wear and tear will the design get? Will it be worn daily? Or just once for a special occasion? For higher-end beads and clasps, use 49 Strand. The superior flexibility and suppleness of the 49 Strand will allow the rich beads to drape elegantly, giving your designs a threadlike appearance; the superior strength means you don't have to worry about breakage. For a quick, fun piece with more budget-minded materials, you might use 7 Strand or 19 Strand instead. 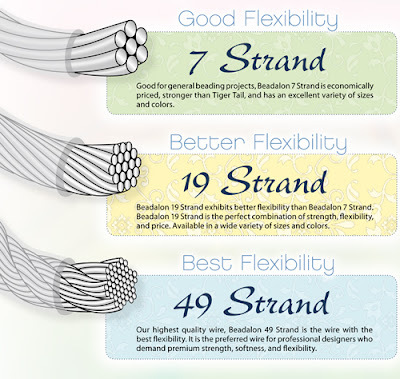 For designs that will be worn often, the flexibility of 49 Strand will help them withstand daily wear and tear. Use the largest diameter wire possible that will pass through the smallest bead hole in your design. Increase bead spacing. Spread contact with the wire over a greater area to reduce the effects of abrasion. Choose a wire with the proper breaking strength consistent with the weight and type of beads being used. The diameter of the wire is not always a good indicator of the strength. Choose the type of wire with the flexibility that will allow your design to look, feel, and drape the way you want. 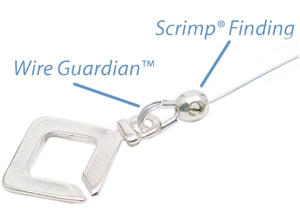 Use Wire Guardians to minimize the effects of abrasion at the clasp. Use Scrimp findings for maximum connection strength.